Get a Muv on with three levels of space saving function. 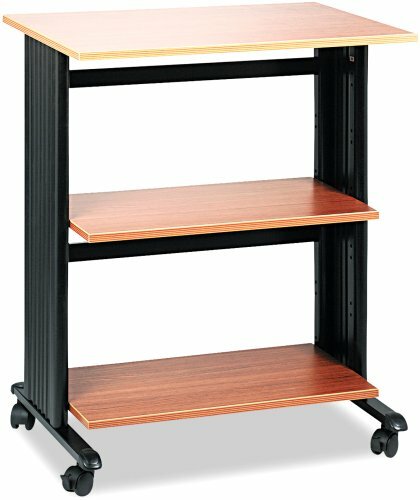 Overall the printer, fax and machine stand is 35"H with durable 3/4" melamine laminate top surface 29 1/2"W x 19 3/4"D x 3/4"H. Fully equipped with two 25 1/2"W x 13 1/4"D x 3/4"H shelves that adjust in 1" increments. Decorative molded side panels hide computer cables and cords for a clean appearance. Steel frame construction with durable powder coat finish. Mobile on four dual wheel carpet casters, 2 locking.